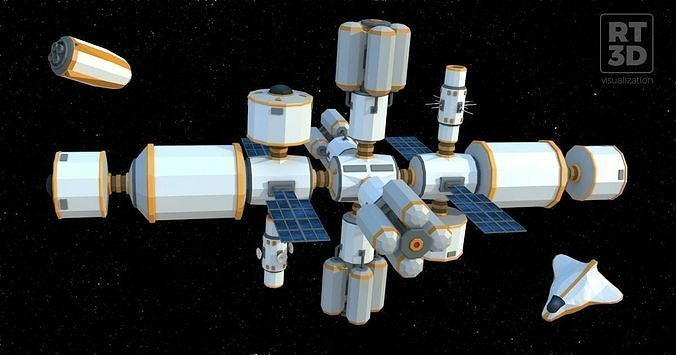 This package contains over 60 modular assets(like habitate, science, industry or intelligence modules) to create space stations in lowpoly flat shaded style. They are drawcall optimized and use only one single texture. The *.psd file is provided as well so you can repaint the assets very easily if you want. Unity3d: Our diligent civilian space engineers allready created a few example stations for you but at the end its up on you how to build them according to your taste. There are so many combinations ... have fun building up your different space stations. For traveling between your space stations there are two types of shuttles. Satellites for controlling your space traffic :) Fly safe!